In the photo right, Liet. 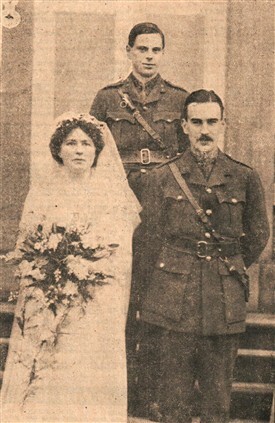 Cecil G. Foster is seen as Best Man at the wedding of Lieut Charles Edward Parker (3rd King's Shropshire Light Infantry) to Miss Hilda Margaret Starkey of Norwood Park, Southwell in January 1915. This page was added by Website Administrator on 13/04/2015.